Over the past few weeks I have been less motivated to train at home and I have needed a change of scenery away from my house’s four walls, so I have been training in the gym more and even doing Intervals again on my beloved Stair Master (oh how I missed you so). The reason I love the Stair Master for HIIT is that I can get a good sprint in, without flaring up my SI Joint (which happens following normal running). I love to sprint, and used to be very good at it in school, but alas, it seems it no longer agrees with my body! Come to think of it, maybe it never did, because back in School I suffered hip, knee and back pain during my athletics years; I just didn’t know how to adjust my training around my aches back then, so I quit! Not any longer! When I feel I need a break from one form of training, I can change to something else for a while. Aim to complete 3 rounds of the following 10 exercises. 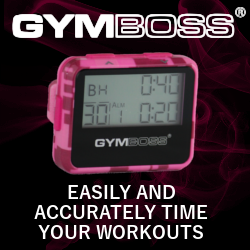 Set your Gymboss Interval Timer for 10 cycles of 20 seconds recovery and 45 seconds effort and take a longer rest between rounds (until you feel ready to recommence). With a little extra recovery time, your form will stay stronger during more reps. My reps per exercise and weights used are in brackets below. Double KB Front Squat (2x16kg) (10, 8, 7 ) – Remember you can do Single KB Front Squats from the Rack, or Goblet Hold position. Double KB Single-Leg Deadlifts (left) (2x16kg) (12, 12, 11) – You can also use 1 KB for this. Renegade Row (2x16kg) (17, 17, 18 ) – You can do Bent Over Row with 1 or 2 KBs. Vertical Pull/”Swing” Burpee (first round I used 24kg, then back to 20kg for next 2 rounds) (7, 10, 9) – Amazing what difference 4kg makes! So that’s today’s torture over. I really enjoyed that workout because there was plenty of variety and each round actually seemed to go in quite quickly; the “hatred” didn’t seem to last as long, so the love came quicker 😉 It’s all about that Love/Hate balance! Hope you enjoy the workout and let me know if you’re taking part in the Back Squat Challenge.